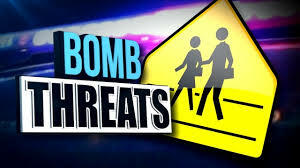 Authorities in Dixon say they’ve made an arrest involving a bomb threat that forced the school district to evacuate and dismiss early. 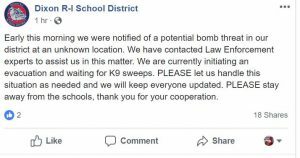 The district posted on its Facebook page the threat was made Monday morning involving an unknown location, and all students were evacuated and accounted for. It was an email threat that was sent around 8:30 a.m.
School was later dismissed at noon for security concerns. Military police from Fort Leonard Wood and a police dog were on the scene quickly to do a sweep of the buildings, although nothing credible was found. The district, near Waynesville, is asked parents and others to stay away from the schools until the issue is resolved.